I have two friends who grew up in Owensboro, Kentucky. One of them is a professional cellist and the other used to play the dulcimer. We drove up there this past Saturday for ROMP Fest1 in another friend’s ‘89 Toyota 4Runner. The parking and camping was disorganized, so instead of moving to the camp area where there were mud puddles and less space, we took to the high ground and took over the top corner of the parking lot field. We were about two football fields away from the center stage and I could see the musicians from my tent. Two friends who had been camping Thursday and Friday night found us and told us about who they’d seen. Del McCoury and David Dawg Grisman were incredible, they said. As we finished the pow-wow and started playing a drinking game that involved passing a lit match and a jar of moonshine, I heard Grisman, Leslie, Hargreaves & Smith take to the stage. Also known as The Brotet, Sam Grisman (bass), Dominick Leslie (mandolin), Alex Hargreaves (fiddle), and Nat Smith (cello) are a group of four young musicians who bring a new sound to old music. They met on the bluegrass festival circuit in their pre-teens, and they play together like only a group that’s been together ten years could. The Brotet came on around 4 pm when we were out in the field at basecamp chucking the football. Their sound is playful and rich, and it put me in a damn good mood. We trekked to the main stage to catch the end of the performance. Bringing alcohol into the concert area was frowned upon unless it was covered by a coozy, which would explain how the vendors ran out of them so quickly. I’ve listened to a podcast, Second Story Garage, that described these guys as a “cross-generational pairing that uncorks sizzling bluegrass with sweat-drenched rock and roll vigor.” They’re an unusual duo—a guitarist in his mid-twenties and a veteran mandolin player in his mid-fifties—but once they started up it was clear what they were doing: two guys having a conversation through their instruments—a jazz approach to bluegrass. One of the best things I heard during ROMP was their rendition of the Beach Boys’ “Long Tall Texan.” As they played, the air became thick and charged. It was almost 6 o’clock when they finally stopped. Sierra Hull has been called a “child prodigy” or virtuoso of sorts, with a voice as twangy and harmonic as her mandolin. Mentored by contemporary bluegrass superstar Alison Krauss from the age of 11 and signed to Rounder Records at 13, Hull released her debut album at 16 (which charted at #2, Billboard Top Bluegrass) and has been recording and touring ever since. She took the stage as the sun began to set with a bass player named Ethan Jodziewicz. She’s a bit more country than bluegrass, but that girl plays a mean mandolin. Smiling sage-like, clasping his guitar, folk legend John Prine sent the crowd into uproar when he walked onstage. Prine was joined by Nashville singer-songwriter Pat McLaughlin, along with the rest of his band. They weren’t more than two songs in before Prine sang, “Angel from Montgomery,” one of his sad-sweet country standards. The audience knew and sang all the words. Throughout his set, Prine moved from band member to band member encouraging the others and leading them. Last on the center stage, Leftover Salmon came out to finish the festival with their jam band-infused Colorado slam rock. Though the band’s lineup has changed through the years, the core relationship between co-founders Vince Herman (vocals, acoustic, guitar, washboard) and Drew Emmitt (vocals, acoustic and electric mandolin, electric guitar, fiddle) remains the same. Herman looked like an aged Jeff Bridges who belted lyrics and kept rhythm-sometimes with a washboard and spoons—while Emmitt moved between electric guitar and mandolin, cutting licks and solos at every turn. After two encore songs, Leftover Salmon vacated the stage and left us standing in the dark. It was past midnight and we needed to find more bluegrass. Somebody next to us mentioned an afterparty at the Pioneer Village. They pointed behind us into the forest. On the way there we grabbed coffee and pulled mutton sandwiches at a food truck. With no interest in sleep we trekked through the dark woods and came out into a meadow lit by fire light. In its center was a cabin with a band playing on the front porch. The late night party moved a bit faster than the center stage. The Brothers Comatose, a five-piece string band from San Francisco, came out without amps. They played acoustic on the porch to a crowd of about fifty. Someone kept breaking glow sticks and spraying the contents all over the crowd. A jar of cherry moonshine made its rounds and everybody danced. By the time Old Salt Union came on the crowd may have been too far gone, but nobody cared, as long as they kept playing music. That’s the thing about Old Salt Union: their music wakes you up quick. It’s complex, high-energy, and kind of makes you shaky. So we romped, for hours. Old Salt Union left the porch then came back on around three in the morning. They walked out into the crowd and as we all huddled in, everyone started singing “The Weight,” by The Band. Not much can (or should) be remembered after that. 1ROMP Fest is a fundraising event for the International Bluegrass Music Museum. It takes place in Owensboro, Kentucky’s 150-acre Yellow Creek Park. 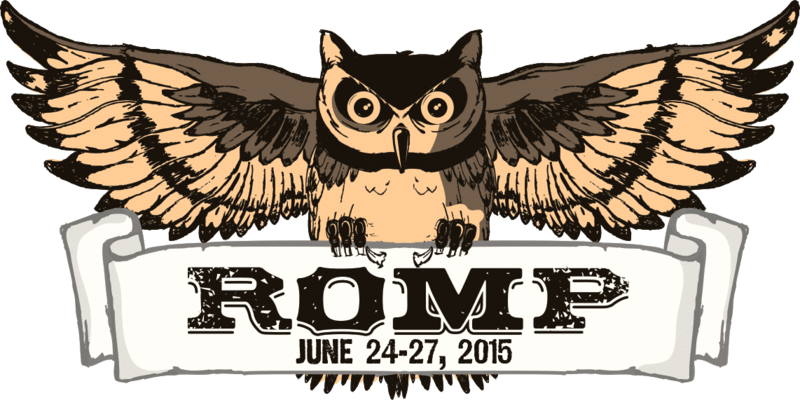 As you may have guessed from the banner, ROMP Fest’s mascot is the Great Horned Owl.